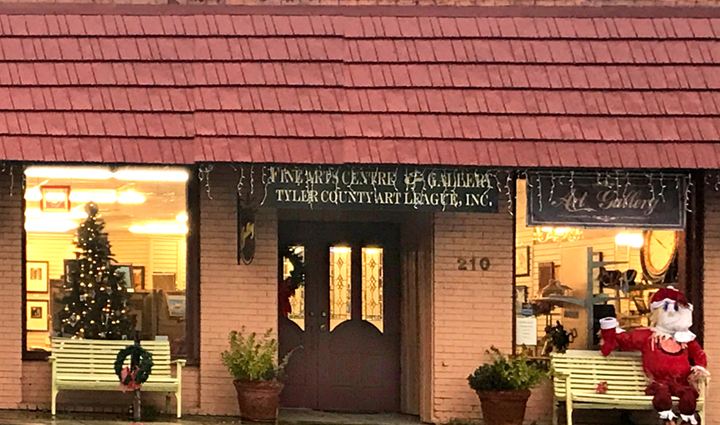 Our gallery is located at 210 W. Bluff in Woodville, Texas. Works of art by TCAL members are on view and available for purchase. All the traditional mediums are represented, including oils, watercolors, acrylics, pastels, photography, pen and ink and charcoal drawings. Other mediums on view include colored pencils, collage, wood sculpture and ceramics and stained glass jewelry. Gallery hours are 10 AM to 5 PM Wednesday thru Friday, and 10 AM - 2 PM Saturday. TCAL has a monthly “Get-To-Gather” the last Thursday of the month at 6:30 p.m. Please join us and take this opportunity to network with local artists, as well as supporters of the arts. Everyone is welcome… It’s “Pitch In”, so bring a tasty treat and let’s all get together and share what’s going on in our arts community. The gallery is part of the “Arts District” in Woodville. The Emporium Stage is located on the corner at 216 W. Bluff. This facility is currently being remodeled as a full theatre for local plays and musical concerts.